This week I read a post by Dr. Brad Gustafson ( @gustafsonbrad ) describing a special moment akin to the “and one” in basketball. A moment where something excellent happens, and more excellent things happen after that! I told him I could not possibly respond to that in 140 characters as there were so many “and one” moments in my year. I will start with my experience participating in #KoryTellers a digital reading connection where teachers and classes have connected with @tritonkory ‘s Kindergarten classroom. Getting to read to Kory’s class was so much fun. In return she read to my class. They were mesmerized. 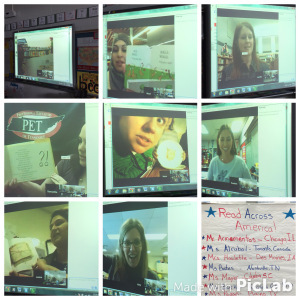 This amazing moment lead to the idea that I could get readers to visit my class all across America for “Read Across America Day” What an AMAZING day for my kids. We were visited by 1 local reader and 9 readers from various states and Canada. We learned about the places and asked questions to our readers about where they lived. Not only was it an exciting, educational day for my kids, it was also a highlight of my year! The second “And One” moment definitely came when my class connected with @rosy_burke ‘s class in Kansas City, Missouri. She was hoping to find an audience for teaching diverse holiday traditions from all around the world. I was hoping to provide more diverse ideas about holidays for my kids. It was a perfect match! Both her class and mine loved the experience. Later her class sent my class books. We had the chance to read to each other’s classes several times throughout the year, and I truly look forward to connecting with her class again next year. Next would be the inspiring opportunity I had to present at the NJ/PA ECET2 Conference this past fall. As someone who is still fairly new in the global world of education, having the opportunity to become a presenter was an incredible experience. It motivated me to want to be a bigger part of the educational world and it inspired met to try becoming a presenter at other conferences. I have since presented at another conference and I am hoping to expand that to several more next year! Finally, having the chance to be a part of the team putting on the inaugural EdCamp South Jersey was incredible. I had the chance to collaborate with incredible people and learn a lot of great things. The “and one” was when I recruited our new science teacher to come to the event. She then took the knowledge and inspiration and created an “Upcycling Makerspace” for our school for Earth day. It was incredible, the kids loved it, and it has potential to launch some great new things at our school! This year has been filled with ups and downs, but there have been many amazing moments, and a few that had some great “and one” opportunities. I am fortunate that I have great people around me to make those opportunities a reality. About two weeks ago I received a schedule for “Read Across America” week at my school. Tuesday was the day this week when we were scheduled to have readers from the community come in and read to our class. We had one scheduled. 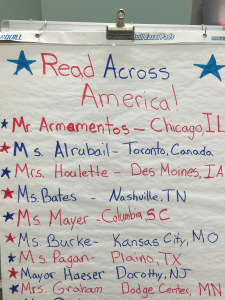 I thought, “what if we really did Read with people from all across America?” How much fun would it be to get readers to share their love of reading from all different parts of our country? Welcome back teacher appreciation week, and specifically, teacher appreciation day. As a teacher, I appreciate many teachers I interact with all the time. I work with some wonderful people who genuinely care for kids. I also have the pleasure of interacting with some incredible educators on a daily basis. All of that is great, but in truth, I am not writing about appreciating teachers… I have done that in the past quite a bit. Instead i want to write about why I appreciate being a teacher. There is no greater opportunity for me than to be in education. I genuinely love what I do. In a time of year and in a time in history when being a teacher is fairly stressful, I can think of nothing better than to remember what I love most and appreciate about my job. First, I love working with kids. They are unpredictable, excited, goofy, fun, and resilient. Kids can do nearly anything! Getting to spend my day with young people as they grow, learn, make mistakes, and develop into amazing people is a privilege that I do not take for granted. Next is the moment. The moment is what most teachers love most about teaching. It is what I love most about working with young kids. There are so many times during the year that kids “get it” and it is one of the most rewarding experiences for me as a teacher. Then, parents. Yes PARENTS! While parents can be the source of a lot of complaining by teachers, I do enjoy many of my parents. These are good people who care about their kids. There are the only people who care about their kids more than I do and when they do recognize your effort, your care for their kids, it is incredibly gratifying. I appreciate having administrators that care about kids. Being an administrator is a difficult, thankless task. While teachers are working on the ground level, administrators are the ones making all of this possible. They have one of the most difficult tasks, making teaching and learning possible. Finally, and I could name many more things about teaching I love, is other teachers. Yes, teachers can get negative, they can also be frustrating at times, but overall they are incredible, dedicated individuals that make an incredible difference in peoples lives. Teachers are generally amazing people that dedicate their lives to children. Education is a wonderful pursuit. Teaching is a challenge that few can take on and do well. I am grateful for that opportunity. So for teacher appreciation this week, I just want to say thank you to all of the people that make it possible for me to teach and to experience all the things about education that I love. Here are 5 links to blogs celebrating teachers that have made a huge impact on my life.